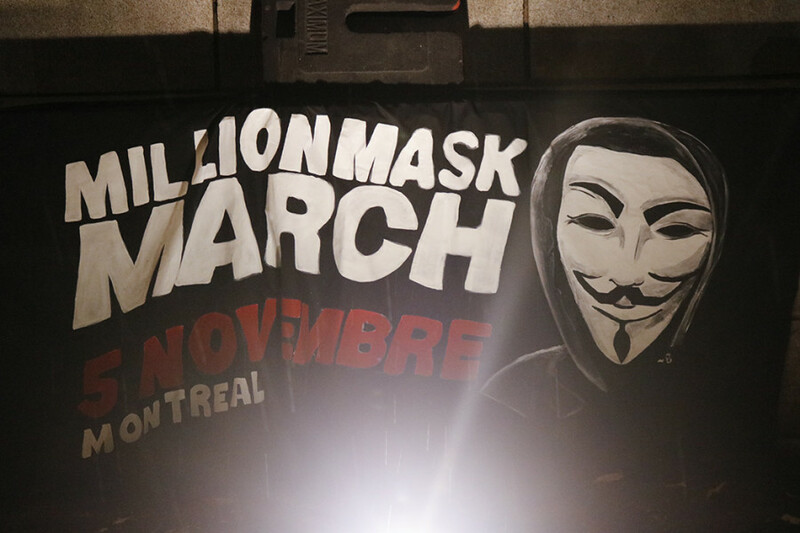 Becky Calabia didn’t ask for a minute of silence to honour the late activist Jean Léger, but he still was on everyone’s mind at this year’s Million Mask March in downtown Montreal on Saturday. Calabia, the organizer, couldn’t hold back her tears as she watched the video played in his honour to a crowd of approximately 60 demonstrators. The one-minute video called, “This Is How You Shut Down a Pipeline,” produced by subMedia.tv, has been viewed more than 13,000 times on Vimeo. On that frigid Saturday night, the organizers and masked protesters––in accordance with the Anonymous movement––called for more direct actions such as the one made by Léger. The three-piece band from Rimouski were followed by another band who also filmed a video along with the masked demonstrators. With their fists in the air, the group of protesters yelled out “power to the people.” At 8:15 p.m., the group started walking. Calabia explained that having many messages––corruption, mass surveillance, anti-capitalism, environmental issues, police brutality, austerity and more––is not a problem. “You don’t have only one problem in life,” she said. 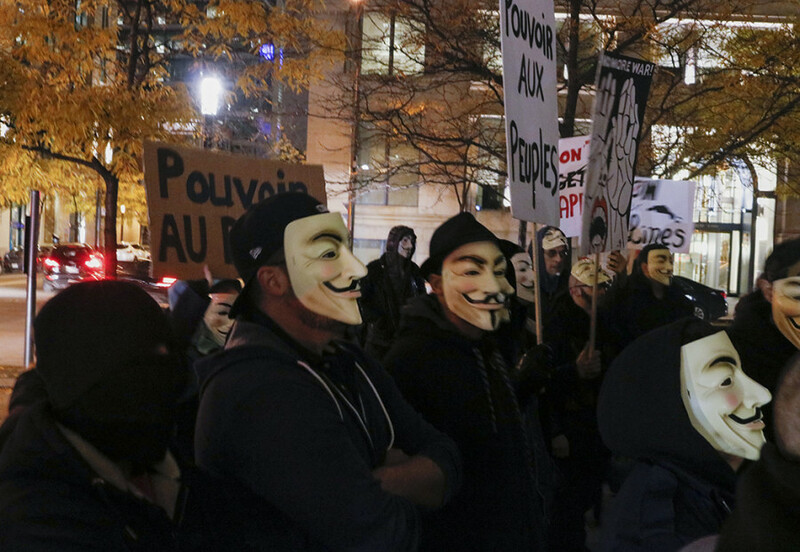 The group then walked onwards to the headquarters of the SPVM. The organizers gave flowers with the names of victims of police shootings, “32 have died in the last 16 years,” one organizer told the crowd. An “anonymiss” made all the flowers, said Calabia. The latter insists on giving credit everyone who contributed to this year’s march, including the flower-maker. “We’re an idea, not separate individuals” she added. Marc was also of those, just like an anonymous donor who gave $700 and two other individuals who helped create the banners and make a promotional video for the march. The demonstrators then proceeded to leave the flowers in front of the headquarters. Events from the past week are obviously timely, explained Calabia. First, the accusations against the Montreal and provincial police, but also the alleged corruption scandal by fundraisers of the Quebec Liberal Party revealed by the television show, Enquête. The U.S. elections also worry Calabia. “What will happen [on Tuesday] will affect us directly,” she said. The march was also in support of the demonstrators in Standing Rock, North Dakota, who are protesting the pipeline being built on Indigenous land. The last stop was Montreal City Hall. 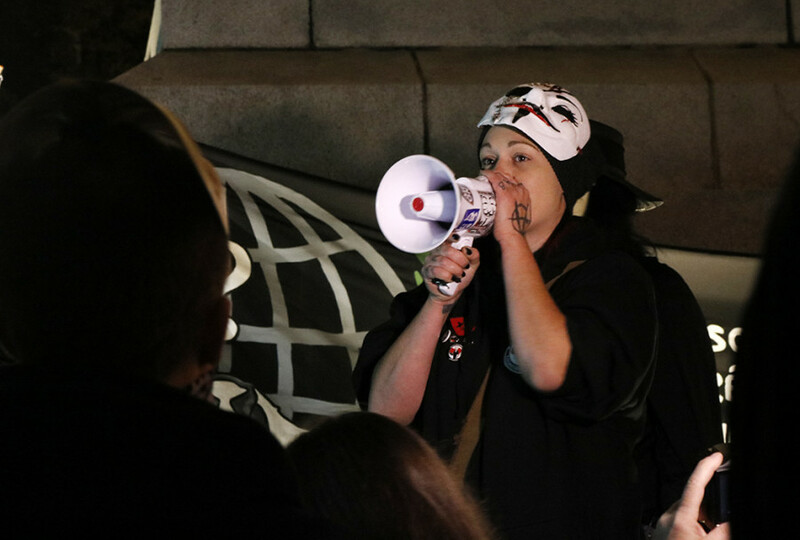 The protesters had already marched for more than two hours and small groups were detaching from the ones holding banners in front, upholding its tradition of starting at Square Victoria, stopping at the U.S. Consulate and ending at City Hall. “Please give back all the banners and signs,” Calabia told the crowd. She made most of them. As a year-round activist, she explained, it can be hard to keep up. Although she was present at the last protest against Enbridge in Montreal, she hasn’t visited a pipeline like Léger. But she was there Saturday night––protesting.